Hey, everyone! Welcome to our new piece of Daily Content! Every Tuesday, we will be releasing articles about our games! These can range from simple things like analyzing the base pentagon in BattleCON to complex card counting in EXCEED. 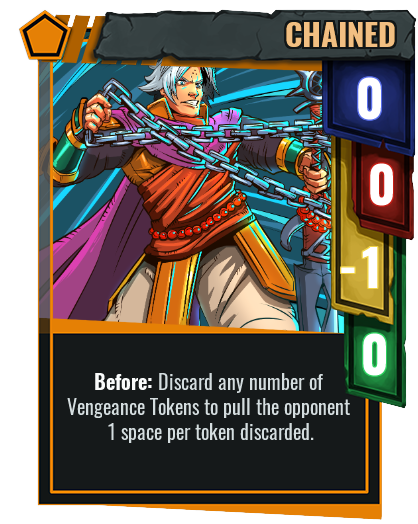 This week, we have a beginner guide for BattleCON! Hello, everyone! Again, I've been playing some BCO and it's becoming even more apparent to me that I need to think faster. With timers implemented, BattleCON has become a much harder game to play, given that I no longer have the luxury to think about all the attacks my opponent can do before setting my own. This meant one thing: I had to pick pairs faster. As such, I thought it would be a good time to remind myself of a very helpful heuristic I came up with months ago: Parallel Attacks. Now, on a fundamental level, Martial and Chained are very different attacks that fulfill very different functions. One deals a ton of damage and the other gives Eligor a lot of hit confirm. There's no way these two styles can be used to achieve the same thing, right? Well, consider pairing either of these styles with Dodge. Notice how Dodge effectively "neutralizes" many of the positive aspects of these attacks. Dodge doesn't need power or hit confirm to be effective. Hence, all Dodge is actually gaining from being paired with these two styles are their Priority -1 modifiers. As a result, Martial Dodge and Chained Dodged are actually Parallel Attacks, since they effectively accomplish the same thing: having a Priority 2 Dodge. Of course, this concept doesn't only apply to styles. In fact, bases are where Parallel Attacks truly become visible. After all, a Strike with bonus range is effectively a Shot and a Drive with bonus priority is effectively a Grasp! Well, Parallel Attacks essentially let you collapse certain attacks into each other. On average, your opponent has 20 possible Style-Base combinations they have access to. Analyzing and attempting to counter every single one of these is not a hard task. It is, however, a long one. Given enough time, one can surely figure it all out. The sad reality is that we don't have that kind of time, so we need some way to cut down the number of attacks we have to consider. This is the true power of Parallel Attacks. If your opponent has a style that gives them Range +0~3, then, it would be safe to assume that every base paired with that style is "effectively" the same thing as Shot. As such, you'd likely not play Burst or Grasp when having to deal with that style. In this example, rather than analyze 5 separate combinations concerning that style, we used Parallel Attacks to simply analyze one scenario. This effectively reduced the amount of time spent on thinking about this style to a fifth of the original time! Such is the point of heuristics. They save you time so that you can analyze those harder-to-grok attacks! But Marco, this isn't always true! I know. In the earlier example, I did state that everything is "effectively a Shot." However, this isn't true, right? Some attacks are faster, deal more damage, or even move the opponent! So, you've got me there; it's not perfect. Heuristics are general shortcuts and will not necessarily apply to all attacks in the game. Use your better judgement and experience to know when the heuristic applies and when it does not. As a general rule, if an attack's main "thing" is giving stats, the Parallel Attack heuristic will work well. This applies to huge stat attacks like Cadenza's Clockwork and Khadath's Lure. On the other hand, if the attack's main purpose is to provide some sort of tricky passive effect (such as the case with Khadath's Teleport), then think twice about applying this heuristic. In the end, much like with all these articles, nothing beats experience! So, get out there and play some games! Just remember that some attacks are more similar than they seem. Tune in next week for another article about our games! Tells us the kind of content YOU want! Just put it in the comments below. Older PostIn-Depth Eligor Guide "You're unworthy to be part of my legend!"